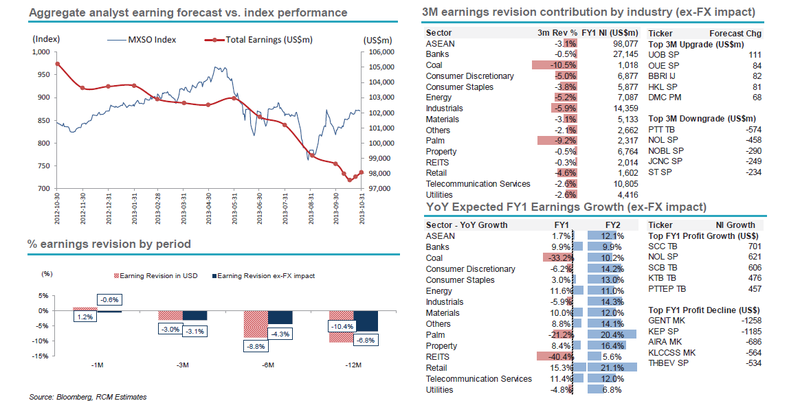 I love this quarterly release from Vincent Fernando over @ Religare where they track earnings growth vs market performance on a sector basis for countries in ASEAN. Banks, non-coal energy, materials , retail and telecom offer the best growth in ASEAN by sector. So whats the timeline of events now? Democrats are going to try their best and hold rallies today with 4 deputy leaders including K. Korn (ex FM) resigning from their posts to protest against the blanket amnesty bill. Mr. T has been gone since 3Q08, this is the 4th attempt to get him back into the country but all past attempts failed between the House readings and Constitution Court hearings. “His” party, Pheu Thai, have only really been attempting half-arsed attempts to bring him back to Thailand and we still think that the majority of them are quite happy when he’s out of the country and not interrupting their daily routines, but if you look at things from Mr T’s viewpoint, he barely has any opposition today in government, the democrats are still considered weak in terms of their ability to win votes, for him this is as good a time as any to really force through an attempt to return Thailand however he’s going to have to modify the law to do so, no wonder he’s becoming more antsy. Well volatility until this all clears up, if it ever does, and without the passing of the infrastructure bill, we will have a sideways range bound market til the end of year, or until LTF’s from local institutions begin to come in. Comment: Hahaha, well if you don’t have to pay back a loan then its wonderful news.